The first urban-oriented Aloft Hotels by Marriott property in the region is being developed in El Dorado Hills Town Center. 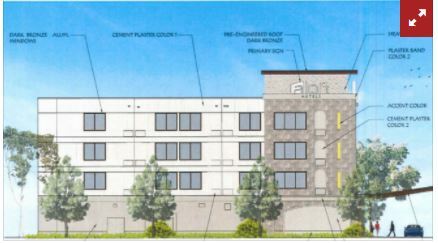 Construction of the 115-room hotel could begin as early as February, in what is estimated to be a $25 million project, said Sam Devdhara, a partner in San Francisco-based 2015 Vine St. LLC, which will develop, own and operate the property. Devdhara also owns and operates the 93-room Holiday Inn Express hotel that has been in Town Center for about a decade. That hotel is now undergoing a $1 million renovation. Aloft Hotels include amenities targeting a tech-savvy demographic. Guests can use their smartphones as room keys. Aloft properties feature voice-activated rooms, and robotic butler service with an autonomous android called “Botlr” that delivers room service ordered via smartphone. “We plan to get the robot,” Devdhara said. More than 125 properties around the world have been opened under the Aloftbrand, which was launched just over a decade ago. Aloft hotels are generally near airports or city centers. Town Center, a lifestyle center in development since the 1980s by the Mansour Co., is the closest thing to a downtown in El Dorado Hills. The center features a mix of small and big-box retail stores, offices, park settings, a pair of lakes, an amphitheater, multiplex movie theater, a Mercedes Benz dealership and other amenities. The hotel will be across the street from the Mercedes dealership. The four-story hotel will benefit from being visible from Highway 50, said Tony Mansour, founder of the Mansour Co.
Devdhara and his partners own 16 hotels in Northern California. He also owns the Hotel Med Park Sacramento across the street from the UC Davis Medical Center in Sacramento. Devdhara is also developing an Aloft hotel in Georgia. “There is nothing like this hotel in greater Sacramento,” he said. With its link to the Marriott International Inc. (Nasdaq: MAR) reservation system and rewards program, the Aloft in El Dorado Hills will get its share of business, Devdhara said. Aloft properties also feature communal pool tables, connections for all kinds of smart devices and lounges with full bars, many of which are programmed with live local music. The first Aloft was opened in 2008 at Trudeau International Airport in Montreal by W Hotels, then a division of Starwood Hotels & Resorts Worldwide. Marriott bought Starwood in a $13 billion deal last year. The prototype Aloft building is a modernistic metal and glass design, but the one in Town Center will have stone accents to match the design elements of the rest of the center, Mansour said. Mark Anderson covers agriculture, banking and finance, restaurants and hospitality for the Sacramento Business Journal.